All day on November 23rd - Black Friday, I'm participating in the Black Friday Blog Hop hosted by Carrie Ann's Blog Hops! And to one lucky Follower, I'll be giving away a $10 Amazon Gift Card! Meet your new favorite authors! I confess I was fascinated the first time I talked writing with Patty and she told me about her Samuri historical Book-of-the-Heart she wanted to write because it tied into her Japanese history. I get so excited when those dream projects grow to fruition . . . and get into my avid reader's hands. I'm still waiting for Samuri Garden to be available, but in the meantime I've been enjoying Patty's sweet short Regency The Partridge and the Pear Tree. You'll fall in love with the wonderful, warm characters who are as uniquely delightful as the author. Meet Patricia Kiyono . . .
1. Party dress or blue jeans? Blue jeans, definitely! 2. Night owl or early bird? Both. I don't sleep more than five hours at a time. But sometimes I take naps when I'm burnt out. 3. TV at home or movie theatre? Neither. I don't know how to turn the TV on (too many remotes) and my hubby won't go out. 4. Broadway or museum? Both! I'm a musician and a history buff. Do I really have to make a choice? 8. Favorite books from childhood: The Boxcar Children. Love those independent and resourceful kids! 9. What music are you listening to? (While you write?) Classical instrumental music. I can't listen to anything with words. 10. Gourmet cook or take out? I have a live-in gourmet cook. He's always done the cooking since he got home from work three hours before I did. When he retired, he started subscribing to food magazines and watching the Food Channel for more recipes and he tries them out! 11. What type of fiction heroine would you be? Jane Eyre or Lara Croft? Jayne Eyre. But I'd love to be Lara for a day. 12. Favorite genre to read? (Is it what you write?) Romantic suspense. I've tried to write it, with Aegean Intrigue, but I'm not sure it's my forte. 13. What would you love to write that you haven’t? A cozy mystery. I love to read Donna Andrews and Joanne Fluke. 14. Fiction hero you would run off with: Janet Evanovich’s Joe Morelli. 16. How many submissions did you send out before publication? None. When I finally got brave enough to submit to a publisher, the manuscript was accepted. 18. Biggest hurdle to getting words on the page and how you overcome it: In writing The Partridge and the Peartree I got hung up on the whole business about how people in various stations of life would address members of the nobility, and how the nobles would address each other. It was a lot to take in! I overcame it by simply writing the story and then looking up each question. 20. When can we get your next book? 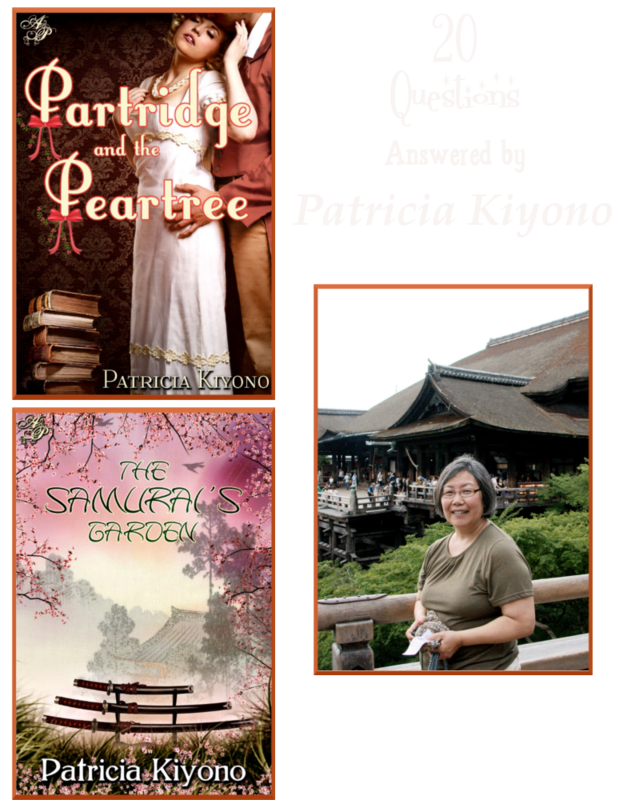 The Partridge and the Peartree was released at Astraea Press on November 1, and The Samurai's Garden is available today, also at Astraea Press! Phillip Peartree, Duke of Bartlett, dreamed of a peaceful life with a suitable mate until a hunting accident left him scarred and nearly deaf. Resigned to spending the rest of his days alone, Phillip has devoted himself to rebuilding his family estate. But, a chance encounter with a lovely young woman in a dusty bookstore rekindles his almost-forgotten hopes and dreams. Hiro Tanaka prepared for a life as a samurai warrior. But his world changed when Japan's feudal system was abolished by the Emperor. Now, he must find a new vocation. Disillusioned with fighting and violence, he travels alone, going north to the island of Hokkaido. Many other samurai wander through the country and are known as ronin. Some have forsaken their honorable way to prey on the less fortunate. Patricia lives in southwest Michigan with her husband, not far from her children and grandchildren. Current interests, aside from writing, include sewing, crocheting, scrapbooking, and music. A love of travel and an interest in faraway people inspires her to create stories about different cultures.